2nd ed., New York, Macmillan Reference USA, 2004, p. 72-77. From the Latin agricultura (ager, field and cultura, cultivation), agriculture refers to the processes by which food is grown and harvested. It also pertains to the sector of the economy dedicated to harvested foods. Soil cultivation for the production of crops began in the ancient Near East around 10,000 BCE (the Neolithic Revolution), and agriculture is the base of the past and current civilizations of the region. In 1996, 50 percent of the Middle East’s population still lived in rural areas. Through the centuries, various rural cultures have developed, and they have balanced environmental and social factors and introduced for example various collective water-management systems. Nevertheless, in terms of food, the Middle East and North Africa (MENA) has become the least self-sufficient of the world’s major populated regions. See the page on this Encyclopedia on the Publisher web site. 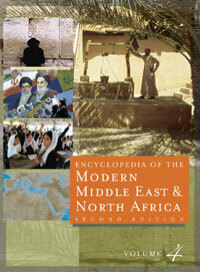 Encyclopedia of the Modern Middle East and North Africa (EMMENA), 2nd ed., New York, Macmillan Reference USA, 2004. This article has been read 1869 times. Dernière mise à jour de cette page le Wednesday 27 March 2019 à 11:47:17. //// -----> Citer cette page? Vincent Battesti, "Agriculture" [en ligne], in vbat.org anthropoasis, page publiée le 13 December 2003 [visitée le 13 April 2019], disponible sur: http://vbat.org/spip.php?article74.